Retail analytics solutions are likely to offer more insights into the location of the user. Location-centric data analytics not only helps retailers to accumulate more data, but it also helps in offering geo-targeted push notifications to mobile devices. This is one of the retail analytics trends that has multiple advantages. Location analytics can also help in tracking the purchasing behavior of consumers. The retail sector is witnessing an increase in the number of IoT devices that are being deployed in its operations. These IoT devices provide greater efficiency in operations and help offer better customer service. This trend is growing rapidly as it generates more data, resulting in a better analysis. Today, customers have become tech-savvy and hop across several channels before making a purchase. Consumers now browse through various social media channels, expert articles, and blogs before deciding on the final purchase. Tracking customers’ digital footprint is not an easy task but retail analytics solutions through cross-platform analytics have made that very easy. This trend has made it easy for the retail store owners to access data through retail analytics solutions and share it with operational and sales teams for better targeting. This can help them in convincing customers through alluring offers to make the purchase. Retail analytics solutions are being leveraged by both offline and online stores and are proving to be a boon for retailers. It enables online retail companies to offer better customer experiences and help offline stores to promote and push products to the customers as per their preferences and needs. 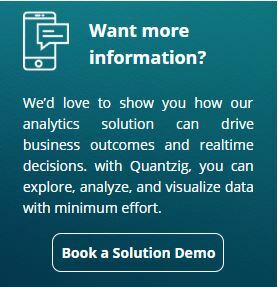 Understanding the needs of customers and serving them with a great shopping experience has been made easy, all thanks to retail analytics solutions! Competitive Benchmarking Analysis: How Does It Help You Stay Ahead of the Curve? Customer Experience Analytics in the Telecom Sector: Why it Matters?